This month’s Tales will be coming from drummer, bassist, guitarist, composer Lionel Cordew. My guest this month is another accomplished player that I have had the honor to work with while out on the Michael Franks tour. One of the first impressions you may get when first meeting Lionel Cordew is his open and easy going manner, his willingness to cooperate and to go beyond what is required in order to do the best job that he can. And man, can he do the best job. In fact not only is it the best job, but it is an exceptional job. And you don’t have to take my word for it. His resume speaks for itself. In his career so far he has toured, performed and/or recorded with Mike Stern, Kyle Eastwood, Michael Franks Gino Vanelli, Angelique Kidjo, Lonnie Plaxico, Cassandra Wilson, Roberta Flack, Bill Evans, Gato Barbieri, Chico DeBarge, Kelly Price, Warren Hill, Jon Lucien, Nelson Rangell, Special EFX, The Fantasy Band, Leni Stern, Kirk Whalum, Mark Johnson, New York Voices, George Jinda, Chuck Loeb, Marion Meadows, Christoph Spendel, Chieli Minucci, Mike Stern Band, Wayne Krantz, Regina Carter, and others. His tours have taken him from throughout the United States, to Southeast Asia, Europe, Japan and South America. Mr. Cordew grew up in Queens, NY and until recently I wasn’t aware just how many prolific musicians were born, grew up and or lived in this unassuming borough of New York. Joining Lionel we have James Brown, Illinois Jacquet, Miles Davis, Louis Armstrong, Ella Fitzgearld, Lenny White, Marcus Miller, Omar Hakim, Najee, Lena Horne, Billy Holiday, Clarence Williams and his wife Eva Taylor, Count Basie, Clark Terry, Tony Bennett, Fats Waller, Dizzy Gillespie, ….. So its safe to assume that Lionel’s musical influences were not only interior experiences, growing up in a gifted musical family with his brothers as inspiration, motivation sprinkled with a little competitive spirit, but also exterior ones, his neighborhood/community surrounded by prodigious musicians that provided him with a daily diet of musical sustenance. This symphonic immersion from inside and outside is conspicuous when you hear him play because not only did he cut his teeth on drums, but he also learned how to play all types of percussive instruments, as well as guitar and bass. This interview is a little different than the ones I’ve recorded in the past in that I venture into the technical, the mechanics of the instrument, such as drum configurations. I also realize that you can spend years around someone and always discover something amazing and new about them. What better way to come out of a hiatus than to interview Lionel Cordew, a true professional, talented, perceptive musician who has spent his life constantly learning, growing, not only as a drummer but as consummate musician. 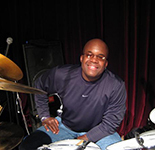 Lionel Cordew, a righty who plays drums left-handed, has been playing since the age of five, professionally for the past eighteen years. The youngest of five boys, he first became interested in performing at the age of three by watching his older brothers’ band rehearsals from atop the basement stairway. It inspired him to raid his mother’s kitchen cabinets for pots and pans, arrange them by size and sound, and play them with a pair of butter knives. The area of Queens where Cordew was raised, was home to an uncanny number of musicians, including James Brown, Illinois Jacquet, Miles Davis, Louis Armstrong, Ella Fitzgearld, Lenny White, Marcus Miller, Omar Hakim, Najee, and many others. Lionel was fortunate enough to see many of them perform in his own backyard at block parties, neighbors’ homes and at local clubs. He performed with Special EFX for more than four years while juggling touring, recording, drum clinics, and television spots with other artists. Lionel has since played with numerous jazz royalty including Lonnie Plaxico, Mike Stern, Leni Stern, and Bill Evans. As a young adolescent, Lionel and his brothers performed every Sunday at the church where his father was the minister and his mother a singer in the gospel choir. The Cordew brothers gained a reputation which brought standing room only parishioners to the church. The area in Queens, NY where Cordew was raised, was home to an uncanny number of musicians, including James Brown, Illinois Jacquet, Miles Davis, Louis Armstrong, Ella Fitzgerald, Lenny White, Marcus Miller, Omar Hakim, Najee, and others. Cordew was fortunate enough to see many of them perform in his own backyard at block parties, neighbors’ homes, and local clubs. Staying local due to family obligations, Lionel received his formal musical education through a training program sponsored by the Local 802 Musicians Union that involved teachers from The Manhattan School of Music and The Julliard School of Music. With pianist/composer Stanley Cowell, he played a wide range of musical types – from traditional jazz to Cowell’s modern jazz string quartets – highlighted by a performance at Carnegie Hall. While in school, Cordew could be heard playing at one club or another every night of the week. His “break” came when he was heard at a small Long Island club by Dean Brown (Brecker Brothers, David Sanborn, Marcus Miller) and Schuyler Deale (Billy Joel, Michael Bolton) who asked him to play in their band, PRIMO. From there, Lionel played with Kirk Whalum, highlighted by a performance on the soundtrack for The Prince of Tides. Recorded on location, Cordew’s kit can actually be seen in the film. After Whalum, Cordew played with Special EFX for more than four years. Heavy touring, recording, and radio and television spots gave him exposure to many other artists on the jazz scene who he toured with and continues to play with today. Cordew is a versatile, high energy drummer with an instinct for rhythms, perhaps stemming from his Caribbean heritage. He has broad musical interests and a particular zeal for contemporary jazz, fusion, r&b, blues, rock, pop, classical, and modern percussion. He has also toured, performed and/or recorded with Mike Stern, Klye Eastwood Gino Vanelli, Angelique Kidjo, Lonnie Plaxico, Cassandra Wilson, Roberta Flack, Bill Evans, Gato Barbieri,Chico DeBarge,Kelly Price,Warren Hill, Jon Lucien, Nelson Rangell, Special EFX, The Fantasy Band, Leni Stern, Kirk Whalum, Mark Johnson, New York Voices, George Jinda, Chuck Loeb, Marion Meadows, Christoph Spendel, Chieli Minucci, Mike Stern Band, Wayne Krantz, Regina Carter, and others. His tours have taken him from throughout the United States, to Southeast Asia, Europe, Japan and South America. This entry was posted in Podcast and tagged Angelique Kidjo, Bill Evans, Gato Barbieri, Jon Lucien, Kirk Whalem, Kyle Eastwood, Michael Franks, Mike Stern, New York Voices, Regina Carter, Roberta Flack, Special EFX. Bookmark the permalink.